Sound Like A BIG RIG! 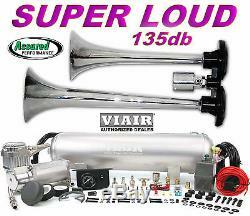 Dual Trumpet 135db Air Horn VIAIR 150psi 2.5 Gallon On Board Air System. Check Out our Video Below. Actual Horn in the Chevy Silverado-See Video. Of course this video does not do justice to just how loud this 135db Truck Horn really is!! This horn and air system can be mounted under the vehicle body. Perfect for Cars, Trucks and SUVs. The trumpet design is flat so can fit almost anywhere. The Horn gets the attention of anyone nearby. DO NOT BE TRICKED INTO PURCHASING CHEAP COPY CAT HORN KITS. THIS IS THE REAL DEAL! Use Air System For Air Lockers Use This Air System Air Springs Use This Air System For Emergency Tire Airing Designed For Many Years Of Hard Use. Get The Attention Of Inattentive Drivers On The Road! This Viair quarter duty on board air system produces a whopping 150psi. The 2.5 gallon tank is about the size of a medium size fire extinguisher. So it fits easily areas like the trunk of a car or a truck tool box an of course it may also be mounted under the vehicle. This kit includes the Viair patented air filter relocation kit, this allows the air compressor can be mounted under the vehicle and filter can be in a location that is clean. Ideal places for the air filter is in engine compartment or inside the vehicle cabin under a seat or under a bed rail is also ideal. This will extend the life of the compressor greatly. 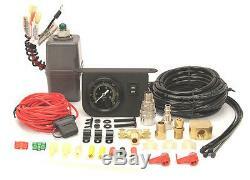 This Viair quarter duty kit includes a 2 air pressure gauge along with a on/off switch. The Viair pressure switch / relay combo makes wiring a breeze. This Viair on board air system totally automatic, the compressor will come on and fill the tank when pressure is at 110psi, and will shut off when it get to 150psi. This kit includes all the necessary fitting for install. Assured Automotive Company is an Authorized VIAIR DEALER. We do not endorse any unsafe or unlawful use of this product. Why is Viair the Best?? - Industry Leader for 12v Air Systems -No Maintenance Oil-Less Design Compressors -Thermal Overload Protection -High Performance PTFE Rings -Gearless Direct Drive PMG Motors -ISO 9001 Certified. Trumpets: 2 Trumpet Diameter: 3.7'' Trumpet Lengths: 14.0'', 11.65'' Overall Dimension: 14'' Long x 6.5'' Wide x 3.7'' Tall Trumpet Material: CHROME Plated Zinc(non-corrosive) Mounting Hardware: Included Mirror Finish-Trumpets will look like new for years to come. Works on any 12v or 24v system. 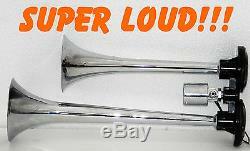 Super Loud-Great Bang for the Buck!! Can fit these trumpets in tight areas like behind a bumper. 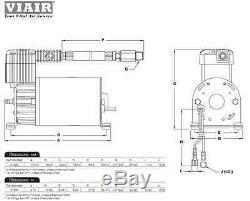 Viair Air System Specs: VIAIR 275c Compressor (27520) 12 Volt Max. AMP Draw: 20 Compressor Dimensions: 6.50'' L. 2.5 Gallon Tank-6 Fitting Ports Air Tank Dimension: 23.5L. Viair Air System Also Includes: 30 amp-150psi for 12v. Illuminated Dash Panel gauge w/ON/OFF Switch. Pressure Switch w/Built in Relay. 20 Feet Air Lines Tubing. 20 Feet Positive Wire /Inline Fuse 1/4 Quick Connect Coupler for other Air Needs. Female and Male Electrical Connectors. Cable Ties and Cable Tie Brackets. Complete Instructions Included Free U. 2.5 Gallon Tank Fill Rate-VIAIR 275c Compressor 0 to 105 PSI -----2 Min. 0 to 145 PSI -----4 Min. 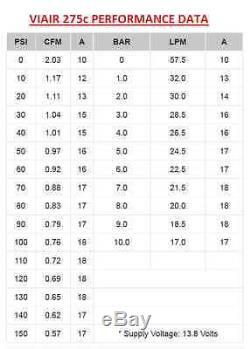 85 to 105 PSI----0 Min. 110 to 145 PSI---1 Min. Horn Switch Not Included Use your vehicle OE Switch (steering wheel) Need A Switch? Check Out our Awesome Feedback. All presumed defective or wrong items must obtain a Return Merchandise Authorization Number before returning. If you decide for whatever reason you would like to return any UNOPENED, UNDAMAGED, UNUSED item back to us. Our Friends across the U. 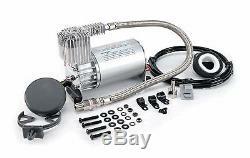 The item "TRUCK TRAIN AIR HORN VIAIR 275c 150psi COMPRESSOR 2.5gal Kit for Cars Trucks etc" is in sale since Tuesday, November 25, 2008. This item is in the category "eBay Motors\Parts & Accessories\Car & Truck Parts\Interior\Steering Wheels & Horns". The seller is "aaco85205" and is located in Mesa, Arizona. This item can be shipped worldwide.